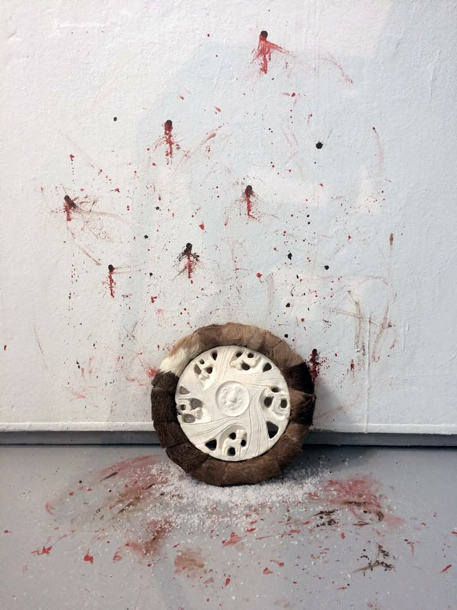 With over two million large mammal vehicle collisions in North America annually, this single deer pelt layered around a carved plaster wheel rim speaks to the subtle human impact on biodiversity. There are many meanings to the roads and bridges cast in plaster. The carved roads separate the deer into separate geographical environments, limiting necessary gene flow from population to population. Inspired by the work of Mary Mattingly and her solution oriented projects, the wildlife bridges carved into the plaster are a suggestion that has been proven effective in reducing the number of animal deaths and the accompanying human injuries and costs. However, the salt which attracts deer to roads and the blood representing the drawn out suffering of the animal are a reminder that even should these measures be taken, there is still more to be done. Hopefully the aesthetic will inspire the viewers to be more mindful of the impact roads have in affecting individual animals as well as populations.